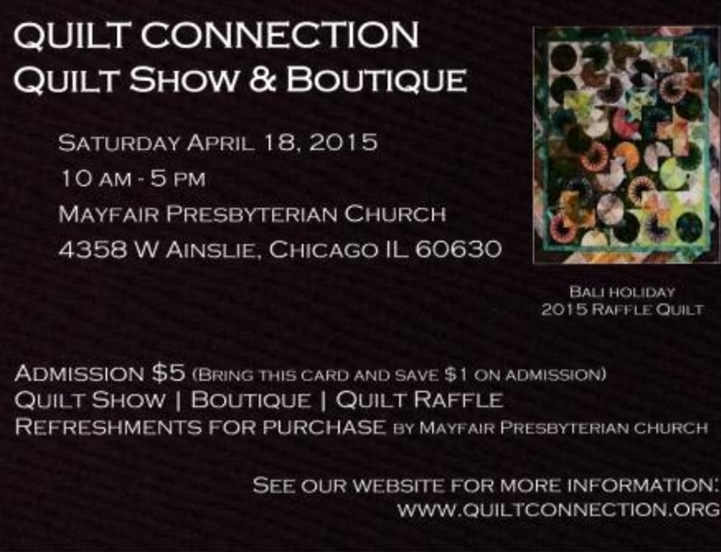 Our quilt show will be held Saturday, April 18th, 2015 at Mayfair Church from 10 AM - 5 PM. Members who want to show their quilts need to complete an entry form available at meetings or by emailing Chris D.
The show will include a display of quilts in the sanctuary and adjacent hall, a boutique in the upper level social room including quilts and other items for sale. Church members will have food and beverages for sale in the lower level room. There is a $5.00 entry fee for the show and boutique. Bring your current quilt guild membership card and get $1.00 off.